High school senior Buffy Summers (Kristy Swanson) attends Hemery High School in Los Angeles; her main concerns are shopping and spending time with her rich, snooty friends and her boyfriend, Jeffrey (Randall Batinkoff). While at school one day, she is approached by a man who calls himself Merrick (Donald Sutherland). He informs her that she is The Slayer, or Chosen One, destined to kill vampires, and he is a Watcher whose duty it is to guide and train her. She initially rejects his claim but is convinced that he's right when he's able to describe a recurring dream of hers in detail. In addition, Buffy is exhibiting uncanny abilities not known to her, including heightened agility, senses, and endurance, yet she repeatedly tries Merrick's patience with her frivolous nature, indifference to slaying, and sharp-tongued remarks. After several successful outings, Buffy is drawn into conflict with Lothos (Rutger Hauer), a local vampire king and his acolyte, Amilyn (Paul Reubens). Two young men, Oliver Pike (Luke Perry) and Benny (David Arquette), who resented Buffy and her friends due to differing social circles, are out drinking when they're attacked by Amilyn. Benny is turned, but Pike is saved by Merrick. As a vampire, Benny visits Pike and tries to get him to join him. Later, when Pike and his boss are discussing Benny, Pike tells him to run if he sees him. Amilyn also abducts Cassandra (Natasha Gregson Wagner), a studious girl from Buffy's class, to sacrifice to Lothos. When her body is found, the news spreads through L.A. and Hemery High, but her murder is met with indifference from Buffy's clique. When Pike realizes there's something wrong with Benny and that he's no longer safe, he decides to leave town. His plan is thwarted, however, when he encounters Amilyn and his gang of vampires. Amilyn hitches a ride on the hood of his van which crashes into a tree just before Amilyn loses an arm. Buffy and Merrick arrive to rescue him and Amilyn leaves the fight to talk to Lothos. After this encounter, Buffy and Pike start a friendship that eventually becomes romantic, and Pike becomes Buffy's partner in fighting the undead. During a basketball game, Buffy discovers that one of the players, and a friend of Jeffrey's, is a vampire. After a quick chase to a parade float storage yard, Buffy confronts Lothos, shortly after she and Pike take down his gang. Lothos puts Buffy into a trance, which is broken due to Merrick's intervention. Lothos stabs Merrick with the stake he attempted to use on him. Lothos leaves, saying Buffy is not ready. As Merrick dies, he tells Buffy to do things her own way rather than live by the rules of others and gives her one final clue: "Remember about the music." Because of her new life, its responsibilities, and the heartbreak of losing her Watcher, Buffy, emotionally shocked, starts neglecting her Slayer duties. When she arrives at school, she attempts to explain things to her friends, but they refuse to understand her, as they are more concerned with an upcoming school dance. Buffy falls out with them as she realizes she has outgrown their immature, selfish behavior. At the senior dance, Buffy is dismayed to find Jeffrey has dumped her for one of her friends. However, she meets up with Pike, and as they start to dance and kiss, Lothos sends his remaining minions to the school to attack the humans at the dance. Buffy confronts the vampires outside, while inside the gym Pike fights and kills the vampiric Benny. After overpowering the vampires, Buffy confronts Lothos inside the school and kills Amilyn. Lothos attempts to ensorcel Buffy again, but when the dance music stops, she remembers Merrick's words and defends herself. She first tries to repel Lothos with a cross, but the vampire king is unimpressed. He grabs the cross, setting it afire, but Buffy uses her hair spray as a makeshift flame-thrower and burns him before escaping to the gym. Buffy sees her classmates recovering from the vampire attack, but Lothos bursts into the gym, promising to kill everyone. The Slayer and vampire duel, a wooden flagpole versus a katana. In the end, Buffy stakes Lothos and kills him. As the survivors leave, Buffy and Pike decide to finish their dance. The film ends with the two of them leaving the dance on a motorcycle. A skeptical news crew headed up by Liz Smith interviews the students and the principal about the attack during the credits. Paris Vaughan as Nicole "Nicki"
Writer Whedon sold the film to Dolly Parton's production company, Sandollar, in the fall of 1991. Production was limited to five weeks to accommodate Luke Perry's Beverly Hills 90210 filming schedule. Whedon was involved in an advisory role early in the production but departed after becoming dissatisfied with the direction the film was taking. Executives at 20th Century Fox removed many of Whedon's jokes, believing the humor to be too abstract for audiences. They also disliked the darker elements in Whedon's original script, wanting to make it a lighter comedy. Merrick's suicide was replaced with his being killed by Lothos, and Buffy's burning down her high school gym to kill all the vampires was eliminated altogether. All this led Whedon to finally walk off the set. He has been highly critical of actor Donald Sutherland's behavior on set, describing him as entitled and difficult to work with. Sutherland had a penchant for improvising or altering his lines in the script, which director Rubel Kuzui allowed him to do freely because he was the film's most high-profile star. Whedon felt this made Merrick's dialogue in the film disjointed and unintelligible. Filming in Los Angeles included the ballroom of the Park Plaza Hotel, where Merrick lives and trains Buffy; John Marshall High School in Los Feliz; and the gymnasium of University High School in West Los Angeles, where the high school dance and vampire attack was filmed. The film debuted at #5 at the North American box office and eventually grossed a modest $16,624,456 against a $7 million production budget. On review aggregator website Rotten Tomatoes, the film has an approval rating of 35%, based on 52 reviews, with an average rating of 4.3/10. The consensus reads, "Buffy the Vampire Slayer's supernatural coming of age tale is let down by poor directing and even poorer plotting -- though Kristy Swanson and Paul Reubens' game performances still manage to slay." On Metacritic, the film has a weighted average score of 48 out of 100, based on 17 critics, indicating "mixed or average reviews". The film was released on VHS and Laserdisc in the U.S. in 1992 by Fox Video and re-released in 1995 under the Twentieth Century Fox Selections banner. It was released on DVD in the U.S. in 2001 and on Blu-ray in 2011. The film was taken in a different direction from the one its writer Joss Whedon intended, and five years later, he created the darker and acclaimed TV series of the same name. Many of the details given in the film differ from the those of the later television series. For example, Buffy's age and history are dissimilar; she's a senior in high school in the film, but the series starts with her as a sophomore. 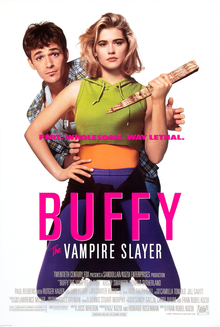 The film does portray who the Buffy of the TV series was before she learned of her destiny as the Slayer: a popular but selfish and superficial cheerleader. In the film, her parents are wealthy but negligent socialites who care little for her and spend their time at parties and golf tournaments; in the TV show, Buffy has a caring, newly divorced mother named Joyce. The supernatural abilities of both vampires and the Slayer are depicted differently. The vampires in the film die like humans; in the TV show, they turn to dust. Unlike the TV show, their faces remain human albeit pale, fanged, and with notched ears, whereas in the series, they take on a demonic aspect, especially when newly raised. The series suggests that new vampires must consciously learn to maintain a human appearance. In the film, Merrick is hundreds of years old, having lived many lives training many Slayers; in the series, Watchers are mortal and specially trained for their role and mission. Merrick's British accent and the manner of his death are different when he appears in flashbacks in the series. Joss Whedon has expressed his disapproval with the movie's interpretation of the script, stating "I finally sat down and had written it and somebody had made it into a movie, and I felt like — well, that's not quite her. It's a start, but it's not quite the girl." According to the Official Buffy Watcher's Guide, Whedon wrote the pilot to the TV series as a sequel to his original script, which is why the show makes references to events that did not occur in the film. In 1999, Dark Horse Comics released a graphic novel adaptation of Whedon's original script under the title The Origin. Whedon stated: "The Origin comic, though I have issues with it, CAN pretty much be accepted as canonical. They did a cool job of combining the movie script with the series, that was nice, and using the series Merrick and not a certain OTHER thespian who shall remain hated." The soundtrack does not include every song played in the film, which also included "In the Wind" by War Babies and "Inner Mind" by Eon. On May 25, 2009, The Hollywood Reporter reported that Roy Lee and Doug Davison of Vertigo Entertainment were working with Fran Rubel Kuzui and Kaz Kuzui on a re-envisioning or relaunch of the Buffy film for the big screen. The film would not be a sequel or prequel to the existing film or television franchise, and Joss Whedon would have no involvement in the project. None of the characters, cast, or crew from the television series would be featured. Television series executive producer Marti Noxon later reflected that this story might have been produced by the studio in order to frighten Whedon into taking the reins of the project. On November 22, 2010, The Hollywood Reporter confirmed that Warner Bros. had picked up the movie rights to the remake. The film was set for release sometime in 2012. 20th Century Fox, which usually holds rights to the more successful Buffy/Angel television franchise, would retain merchandising and some distribution rights. The idea of the remake caused wrath among fans of the TV series, since Whedon is not involved. The project did not have any connection with the show and would not conform to the continuity maintained with the Buffy the Vampire Slayer Season Eight and Season Nine comic book titles. Not only the fandom, but the main cast members of both the Buffy and Angel series expressed disagreement with the report on Twitter and in recent interviews. Sarah Michelle Gellar said, "I think it's a horrible idea. To try to do a Buffy without Joss Whedon... to be incredibly non-eloquent: that's the dumbest idea I've ever heard." Proposed shooting locations included Black Wood and other areas in rural England, due to budgetary constraints and the potential setting being outside of the city, an unusual change for the franchise. In December 2011, more than a year after the official reboot announcement, the Los Angeles Times site reported that Whit Anderson, the writer picked for the new Buffy movie, had her script rejected by the producers behind the project, and that a new writer was being sought. Sources also stated that "If you're going to bring it back, you have to do it right. [Anderson] came in with some great ideas and she had reinvented some of the lore and it was pretty cool but in the end there just wasn't enough on the page." As of July 2018, Joss Whedon announced at San Diego Comic Con that he was working on a reboot of the series and that it might feature a slayer of color. ^ Marx, Andy (1992-05-17). "A look inside Hollywood and the movies : SUMMERTIME BRUISE : Who Dares Intrude During the Season of the Giants? Several Rock-Slinging Davids". Los Angeles Times. ^ "Buffy the Vampire Slayer (1992) Weekend Box Office". Box Office Mojo. Retrieved 2007-04-19. ^ "Buffy the Vampire Slayer (1992)". Rotten Tomatoes. Retrieved February 6, 2007. ^ "Remembering Buffy the Vampire Slayer film". Yahoo movies. May 5, 2015. Retrieved June 25, 2016. ^ a b c Robin Burks (2017-12-22). "Things You Didn't Know About the Buffy the Vampire Slayer Movie". screenrant.com. Retrieved 2018-02-18. ^ a b Tasha Robinson (2001-09-05). "Joss Whedon Interview". AVClub. Retrieved 2018-02-18. ^ Nico Lang (2013-01-02). "25 Little-Known Facts About 'Buffy the Vampire Slayer'". thoughtcatalog.com. Retrieved 2018-02-18. ^ "Film locations for 'Buffy the Vampire Slayer'". movie-locations.com. Retrieved 2018-02-19. ^ Mitchell Sunderland (February 5, 2011). "'Perverting the Youth of America': The Oral History of Teen Classic 'Jawbreaker'". Broadly. Retrieved July 20, 2017. ^ Welkos, Robert W. (1994-05-10). "Weekend Box Office `Honors' Tops in a Lackluster Bunch". The Los Angeles Times. Retrieved 2010-12-28. ^ "Buffy the Vampire Slayer". Rotten Tomatoes. Retrieved 27 August 2017. ^ "Buffy the Vampire Slayer reviews". Metacritic.com. Retrieved 25 June 2016. ^ "Bronze VIP Archive - January 17, 1999". Cise.ufl.edu. 1999-01-17. Archived from the original on December 20, 2014. Retrieved 2010-08-23. ^ Kit, Borys (2009-05-25). "'Buffy' in for feature relaunch". The Hollywood Reporter. Retrieved 2010-08-23. ^ "Exclusive: Marti Noxon on the Future of 'Buffy'". Fearnet. 2010-07-21. Retrieved 2010-07-24. ^ Kit, Borys (2010-11-22). "'Buffy' Remake Finds a Home at Warner Bros". The Hollywood Reporter. ^ "Comingsoon.net". Retrieved December 10, 2010. ^ "YouTube". YouTube. Retrieved 2014-05-18. ^ "'Buffy the Vampire Slayer' movie looking for new writer | Hero Complex – latimes.com". Herocomplex.latimes.com. 2011-12-22. Retrieved 2012-06-11.